Gaps in the mortar caused over time by weathering and decay not only look bad but can let in water, which through constant freezing/thawing and subsequent salt deposits can cause long-term damage. The water can get into the cavity itself and start to cause damp problems, especially you have insulated cavity walls. If you can easily see open joints around the mortar bed, then it is time to think about repointing. Pollution damage – city properties suffer from the effects of pollution from all forms of transport as well as everyday use of fossil fuels. 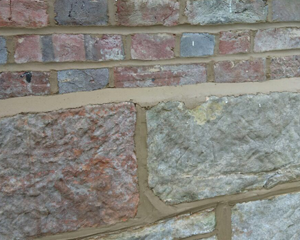 Get a free quote online for repointing and/or brickwork now. 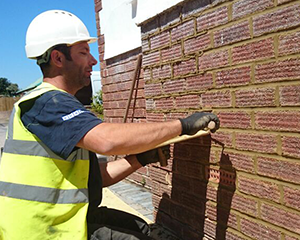 How Do We Repoint Your Brickwork? When raking out old mortar we use 5″ angle grinders with 6mm mortar raking diamond blades and dust extraction units, giving clean cuts to the top and bottom joints ready for the new mortar. In some cases power tools are not an option, so we use hand tools such as comb hammers. Before applying new mortar, the brickwork is cleaned using a spray applicator to wash away any existing dust and provide maximum grip to the brickwork. 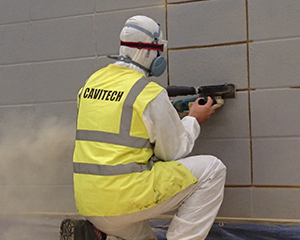 Watch the video below to see the Cavitech team repairing and repointing brickwork. How Deep Should the Joints Be Raked Out? Some builders only scratch back the old mortar to provide a ‘key’ for the new mortar. This shortcut is WRONG and will result in the new mortar ‘blowing’ and eroding due to weathering in a very short time! We rake out the old mortar to a depth of 15-20mm as standard practice (unless instructed otherwise for whatever reason). All of our work is guaranteed, and is carried out by qualified professionals. We also extract and remove insulation that’s damp and causing problems, and replace/install loft insulation.